Last post 12-05-2008, 9:45 AM by Mudd. 8 replies. Has anyone found what causes this. I tested cuteeditor on a new blank project, and it works fine. What in my current project could affect this. Can you set FTP access to your site? I don't have any idea now. I caught the exceptions, and here is where it goes wrong. I don't know if this will help. if you are setting styleSheetTheme in web.config, then remove it and set it in you page in stead. 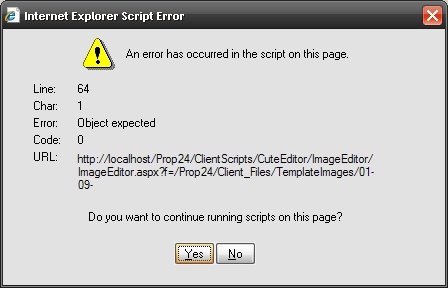 Thats what I did to resolve Object error in asp.net 2.0.